A very funny and creative movie, this one works mostly because of the hilarious performance steve martin gives the whole way through. An absolutely hysterical movie, this film takes a really clever premise and then finds all kinds of ways to use it and twist it and make it work for different situations. The storyline here has two different people occupying the same body. That means it takes the two of them, working together, to move the body and control it. The problem is, the two personalities inside are often at odds with each other. On top of that, the character, Roger, is about to handle his biggest trial as an attourney while also trying to find the man who can make things right and get his body back to normal. The main reason why so much of this work is not the premise, it’s the actor. Steve Martin goes with every joke, no matter how ridiculous, and makes them work, giving it his all. Watching him try to be two different people inside of one body, is hilarious. Activities as simple as walking become an issue for this guy, and Martin’s interpretation of how to play all of that is perfect. All Of Me am a terrific movie. That’s because it has a uniquely creative and interesting premise, as well as a lead actor who has the ability to carry it out and pull off everything involved. The actor is Steve Martin, a comic genius. Like Bill Murray, Martin is comedic gold, understanding how to get laughs more than just about any other actor out there. And in all of me, he gets a storyline that gives him the opportunities to not only find the laughs, but to play a part that has never been done before. The story here is about a body transfer. Now the obvious, usual way to go about that is to have two characters switch bodies. That’s been done before, over and over again, from freaky Friday to the change up to heaven can wait. But this is something different. The two characters don’t switch bodies; they actually both occupy the same body. That means two people are controlling one body. On top of that, it’s a man and a woman, so the jokes about what the two of them have to handle together (sleeping with an attractive woman, going to the bathroom), are all a lot of fun. At the start of the movie, we meet roger, a lawyer who plays in a jazz band as a hobby. He is turning thirty-eight, has a girlfriend who he wants to marry, and is ready to ask his boss at the law firm for a partnership. Roger tells his girlfriend that he’s ready to finally start taking life seriously. Turning thirty-eight has made him think about the future, and he knows he can’t just keep sitting around. He quits his band and then goes in to see the boss, ready to talk serious. Roger’s boss has a job for him to do. He’s not ready to make Roget a partner, but he’s close. First roger has to handle this job, and then one other, where it’s actually the boss who is on trial. If roger gets both of those cases / situations taken care of, he will be made a partner. So he heads out to the first job. There’s a woman who is represented by the firm, and is on the verge of dying from a horrible medical condition. She is about to leave a ton of money to the firm, and roger has to go over to her estate to pick up the will and make sure everything is in tact. This woman is Edwina cutwater, and she has a radical idea, to keep from dying, that she is convinced is going to work. The idea is for her to have a sort of religious guru say some spiritual words and transfer her soul into the body of a much younger woman. That woman, terry Hoskins, is all for the soul switching, and roger thinks he knows why. Before any of it is done, Edwina is writing her will and plans to leave all of her money to terry. Then, when Edwina is in terry’s body, she will have all of her own money back. Roger thinks that terry is taking advantage of a crazy woman in order to get Edwina to give away all her money and sign it over to her. He can’t even imagine that there’s any legitimacy or truth to this soul switching idea, and he lets Edwina know how crazy he thinks she is. That’s when Edwina goes into the law office the next day to have roger fired because of his brutal and honest disrespect. It’s there, at the law firm office that she dies, right as roger is leaving the building. The bowl that contains her soul ends up falling out the window and landing on Roger, hitting him in the head. Suddenly there’s a woman’s voice in his head. He can’t walk right, and falls back against a car. 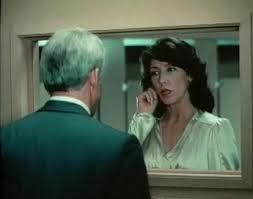 Roger gets a glimpse of him in the cars side view mirror and sees Edwina’s face talking to him. She’s in his body, sharing it with him! The situation is that Edwina is controlling one side of the body and roger is controlling the other. The two of them have to do everything together that requires two hands or two feet. So, walking, for example, is a two person in coordination with each other, act. Watching Steve martin perform this part of not being able to walk right, and instead, acting as if two different people are walking inside one body, is amazing. So are the hand gestures and voices he uses for the Edwina part of him. As if controlling this body wasn’t enough work, roger now has to go into trial to defend his boss in a court of law. That’s not so easy considering that he and Edwina feel differently about the boss and whether the man is innocent or guilty. At times the court case scene feels a little like liar, with one personality trying to shout things out, without having any filter, and the other one trying to cover the mouth up, unable to believe what is happening. The difference between that movie and this one is that with that Jim Carrey film, this one joke was carried on for the entire movie. Here, in all of me, it doesn’t even last for an entire scene. Instead, the court room scene has all different kinds of ammunition working at once, including a part where the roger portion of the body falls asleep and Edwina has to take over and run the court case on her own, inside roger’s body. All Of Me has a multilayered plot that even includes a villain. I love how the court case is only one scene and hardly a major part of the plot. Other movies would have been all about the trial, but this film has a bigger agenda and more important problems to attend to. Roger has to find the guru and then get him to remove Edwina’s soul from his body and put it back where it was supposed to go, into terry’s body. Only terry isn’t so sure if she wants that anymore. At times all of me does feel a little silly, but that’s mostly just with the guru, who is kind of a ridiculous cartoon character. Steve Martin helps make that character funny, doing imitations of the guru’s voice and things like that, so it never really takes us out of the movie, or becomes too crazy. And then there’s the premise and all of the humorous situations that it leads to. This is some really clever stuff. What’s funny is that it’s just a slight twist more than the usual two people switching body’s idea, but by doing it in a way where two people now occupy the same body; so many creative and hilarious scenarios suddenly sprout up. 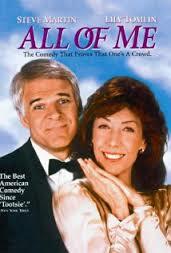 Steve Martin handles the role perfectly, walking around like a marionette being controlled by two different puppeteers. It’s an absolutely hilarious film.